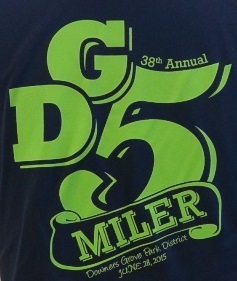 Yesterday I ran the Downer's Grove 5 Miler. I will just say right up front there are no hills in Chicago and we are therefore wimps when it comes to hills. Downer's Grove has what they like to call rolling hills. I feel like I'm exaggerating when I say it was hilly, because in all honesty, it wasn't like there was some mammoth hill like Cricket Hill1 which I had just run up the day before at the end of my long run. No, these hills weren't too bad. There were just a lot of them. Each time you thought it was going to even out, nope, more hills. By the end, going down hill wasn't helping me make up any speed lost on the uphill and so I just gave in and slowed down. That's not to say I didn't have a good time on this race. It was well run, packet pick up was easy, the course wasn't crowded, support was good and the course was scenic2. Race day had me up a little after 5 a.m. as we had to drive to Downer's Grove (henceforth known as DG) and the race started at 7:30 and we had to pick up our packets before 7. My sister and I contemplated driving to DG the night before and staying in a hotel, but frugality won out and we just got up early. She picked me up and we headed on out of the city. Traffic was light and we made it there with more than enough time to spare. DG was having a fair downtown and so there were lots of street closures, but we just followed the detour signs and the guy in front of us who looked like he was a runner3. We found (free!) parking and then followed the other people who looked like runners to the lot next to the DG park district building to collect our packets. After donning our bibs, stashing our gear at the CARA tent and putting on some sunscreen, we made a quick trip to the porta-potties, for which there was a short line4, and we were ready to go. Being a small field, there were no pace signs, so we found a spot that looked good, listened to the recorded version of the Star Spangled Banner and, once the air horn sounded, we took off. I had asked my sister what pace she was planning on running and she said between 9's and 9:30's. So I asked her if she'd be willing to pace me at 9:20s for the first 3 miles. I feel like I got an affirmative response, but we ended up clocking our first two miles at 8:58 and 8:59 - a bit faster than I had wanted to go. She assured me that I could keep up this pace, but my body (and probably my brain) wasn't having it. Third mile I slowed down to around a 9:30 and then the fourth mile came and even though I remember it as being flat, I had an even slower mile of 9:50. I came back for the final mile clocking a 9:30 something and kicking it a bit at the end, I finished in 47:14 / 9:27 overall pace. Only somewhat slower than planned. I blame the hills, and my pacer. Finishing stats: 13/31 in my age group5, and 261/453 overall. I didn't quite make my top half overall finish, but you know, hills. Overall, I liked this race. What it lacked in flatness and closeness to home, it made up for in being different. We discussed even going out to the burbs for runs so we could maybe eventually benefit from hill training. After the race we hung out, got some chocolate milk from the Nestle people that seem to be everywhere lately (not complaining) and fresh fruit from a local grocery. After stretching, chatting with CARA people and doing a tour of downtown DG to find the Starbucks that we could have easily gotten to if half the streets downtown weren't closed, we headed back to the asphalt jungle of the city content that at least once this month I left the city limits6. I realize Cricket Hill is in no way mammoth. But when you live in Chicago mammoth becomes a relative term. Again, this is relative. When you run the same routes all the time, even if it is by the gorgeous lake front, a change of scenery is always welcome. You know the look, running cap, running watch, running shirt, probably running shorts but we couldn't see that far into his car, possibly a 26.2 sticker on the back of the car. My sister was actually a bit disappointed there was only one line instead of multiple lines. She has a strategy that goes something like: pick the line not necessarily the shortest, but the one that seems to be servicing the most porta-potties. This way turn over in said line is quicker. I for one think the one line, though potentially unwieldy, is much more equitable. Good for 3 more points in the CARA Circuit standings. This is hyperbole. I left the city limits when I went to that run in Roselle on the 7th. Oh, and we recently bought a new car that took us all the way to Countryside a little over a week ago. And I left the city all together when I went to NY for work at the beginning of the month. Sheesh, it's like I barely even live here. So I'm reading Infinite Jest and you know how DFW is with the end-notes. I thought I'd try them on for size. It's an interesting way of writing. You get to say so much more without having to pare down your thoughts to stuff that makes sense. Is it genius or is it the lazy writer's way of (not) dealing with a rambling mind? Congrats on your CARA point haul. I might run the "4 on the 4th" this weekend and hopefully I can get one or two points as well.